There are few things that go better together than fall weather and apple picking. 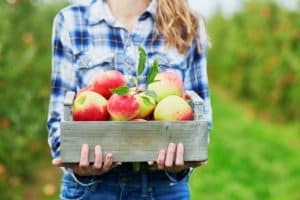 Here are the best apple picking spots near Westchester County, NY, the top spots to pick up the freshest of fruits. Visit the farm for apple picking season at Harvest Moon. The fall festival is hosted each weekend throughout picking season, along with select weekdays, too. The festival includes plenty of apple picking, along with weekend activities like hayrides, a bounce house, and live music. Picking is open each day, with a wide variety of apples available. It’s a family-friendly event for all to enjoy. Be sure to stop by the store on weekdays or the picking tent on weekends to purchase a bag before heading out to pick apples. Apples are available inside the store too, with favorites like McIntosh, Gala, and Ginger Gold. This northern Westchester orchard has become a favorite for many families throughout the area. Walk through the apple orchard as the leaves change color. Head up to the barn and grab a half bushel, or pick your own bag and take a tour of the orchard. There’s even a pole picker available for those hard-to-reach apples. From early September through early October, find McIntosh, Cortland, and Rhode Island Greenings apples. From early October through early November, Rome, Baldwin, and Red Delicious apples are available. While you’re there, see if you can solve the twists and turns of the corn maze. This orchard was founded back in 1901, and is currently farmed by third-generation owners Bruce and Maureen Salinger. They have 18 varieties, along with other fruits like peaches, pears, plums, and cherries. Harvest times vary for each apple, but you’ll find most varieties fresh all year long in the farm store, thanks to the Crisp-Aire cold storage which prolongs the life of each apple. Discover apple varieties like Paula Red, McIntosh, Gala, Macoun, Jonagold, Fuji, and Granny Smith. From apples that are ready-to-eat, to those perfect for that pie or strudel, there are plenty to choose from at Salinger’s. If we’re to believe that old saying, an apple a day keeps the doctor away. 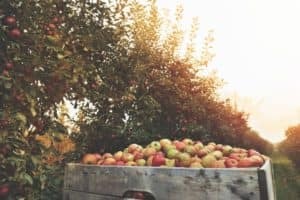 So, get out there and visit these top apple picking spots near Westchester County this fall!